Which patellae are likely to redislocate? The purpose of this study was to identify the risk factors for recurrent lateral patellar dislocations and to incorporate those factors into a patellar instability severity score. Sixty-one patients [male/female 35/26; median age 19 years (range 9–51 years)] formed the study group for this investigation. 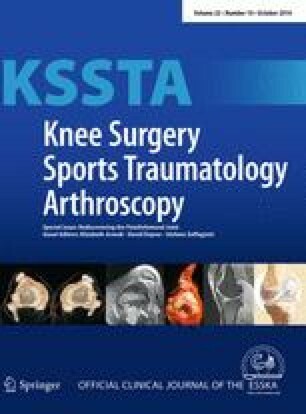 Within the study group, 40 patients experienced a patellar redislocation within 24 months after the primary dislocation, whereas 21 patients, who were assessed after a median follow-up of 37 months (range 24–60 months), had not experienced a subsequent episode of lateral patellar instability. In all patients, age at the time of the primary dislocation, gender, the affected body side, body mass index, bilateral instability, physical activity according to Baecke’s questionnaire, the grade of trochlear dysplasia, patellar height, tibial tuberosity–trochlear groove (TT–TG) distance, and patellar tilt were assessed. The odds ratio (OR) of each factor with regard to the patellar redislocation was calculated using contingency tables. Based on these data, a “patellar instability severity score” was calculated. The patellar instability severity score has six factors: age, bilateral instability, the severity of trochlear dysplasia, patella alta, TT–TG distance, and patellar tilt; the total possible score is seven. Reapplying this score to the study population revealed a median score of 4 points (range 2–7) for those patients with an early episode of patellar redislocation and a median score of 3 points (range 1–6) for those without a redislocation (p = 0.0004). The OR for recurrent dislocations was 4.88 (95 % CI 1.57–15.17) for the patients who scored 4 or more points when compared with the patients who scored 3 or fewer points (p = 0.0064). Based on the individual patient data, the patellar instability severity score allows an initial risk assessment for experiencing a recurrent patellar dislocation and might help differentiate between responders and non-responders to conservative treatment after primary lateral patellar instability.